To Err is Human. Yet most of us go through life assuming (and sometimes insisting) that we are right about nearly everything, from the origins of the universe to how to load the dishwasher. 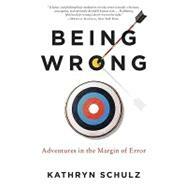 In Being Wrong, journalist Kathryn Schulz explores why we find it so gratifying to be right and so maddening to be mistaken. Drawing on thinkers as varied as Augustine, Darwin, Freud, Gertrude Stein, Alan Greenspan, and Groucho Marx, she shows that error is both a given and a gift-one that can transform our worldviews, our relationships, and ourselves. Book jacket. Kathryn Schulz is a journalist whose work has appeared in the New York Times Magazine, Rolling Stone, Foreign Policy, the Nation, the Boston Globe, and the "Freakonomics" blog of the New York Times. She lives in New York's Hudson Valley.